We spent a month away in Asia and one of the best things being there is that meals are often affordable and tasty! 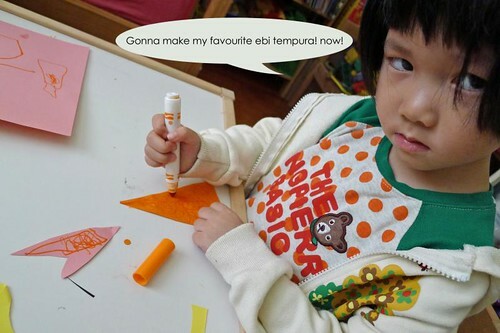 Kiddo has taken a liking to Japanese food and we decided to make some to bring back those yummilicious memories. Get kiddo talking about those dining experiences. Relate to what kiddo and others like to eat and try to save hers as one of the last pieces to work on. Throughout the exercise remind her that its a feast/picnic and that it must include something for everyone cos it’s simply good to share. 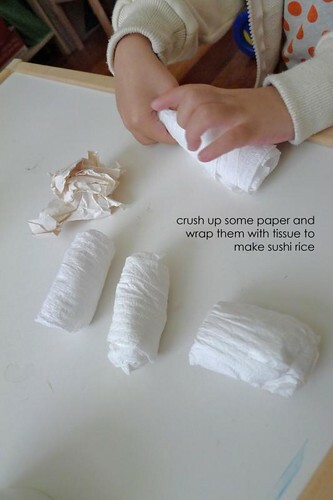 To make rice balls, simply crush up some scrap paper and then wrap them with tissue paper. Secure the ends with sticky tape. Kiddo can help with tearing and rolling up the tissue paper. 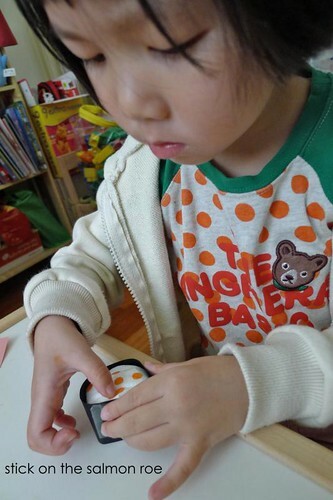 Get kiddo to trace out the sakae and tamago using one of the prepared ‘rice ball’ so as to get them in the correct proportion/shape. Then kiddo gets to cut them out and draw in details such as textures. Remind kiddo what textures were on those that she’d eaten. The nigiris are easiest to make. Just curve up the pieces of sakae and tamago that were cut and press them in the bowl of your hand. 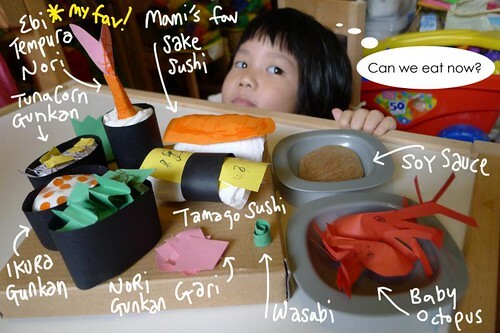 The paper will curve nicely and then all that’s to do is stick them onto the ‘rice balls’. Cut up a small strip of black paper to be used as nori for the tamago sushi. 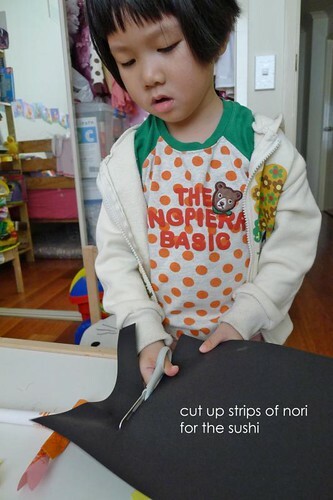 Get kiddo to prepare the ‘nori’ by cutting up strips of black paper. 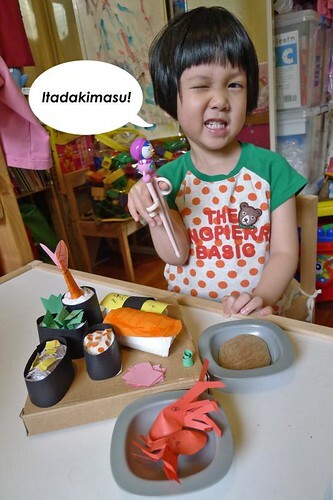 While kiddo is at it, get busy with preparing/cutting up ‘ingredients’ such as ikura, corn, tuna flakes, green nori or whatever kiddo fancies having. As the ingredients are small fine cut outs, adhere a sticky tap with its sticky side up on top of the rice balls. Kiddo is totally fascinated with these though she doesn’t quite dare to eat them. Kiddo gets a good laugh when I leave the tentacles outside my lips before chewing them up whole. These seasoned baby octopus are called chuka idako (heh talk about learning something new everyday) by the way. 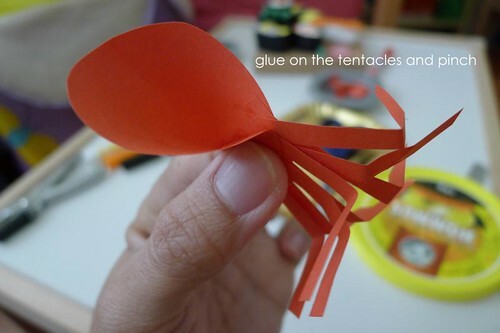 The main thing about these is to glue and pinch the part where the head meets the tentacles. 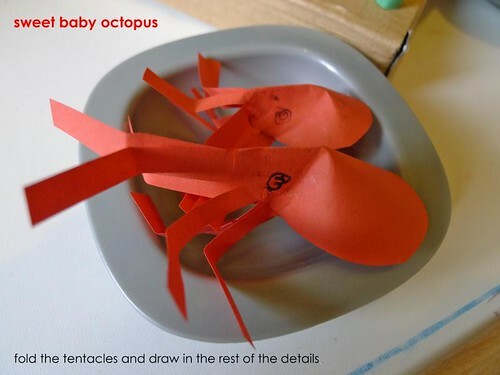 Also fold/curl the tentacles and get kiddo to draw in details. When they are dry, the octopus should look like these. 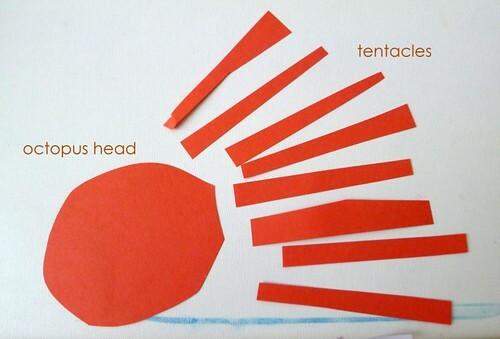 Help kiddo make out the shapes that form the ebi….i.e. a large triangle for the body and a V shaped tail piece. 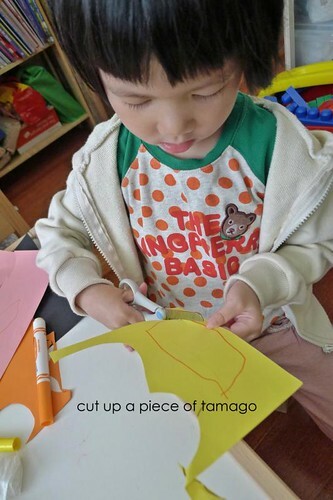 After kiddo cuts them out, get kiddo to draw in the texture. 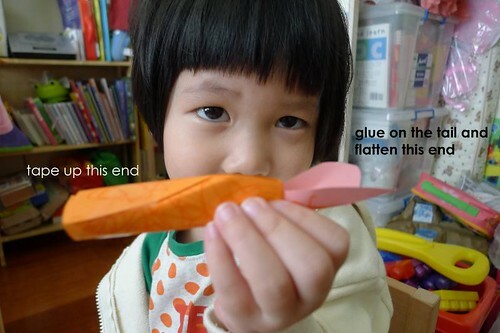 Then tape up 1 end and taper the sharp end with the tail glued on. 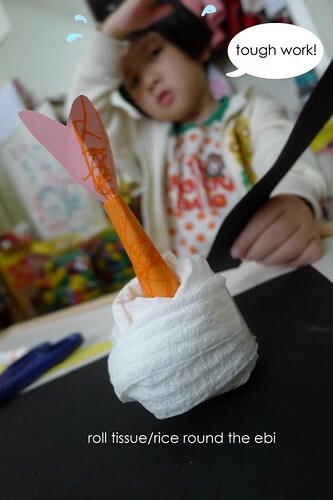 Wrap some tissue round the ebi and secure it with sticky tape. Then wrap the nori around it to complete the maki. And a few small details to work on before wrapping up…..
& use the flat cardboard box to ‘plate up’ the items. Last but not least…here’s to the sushi feast! Itadakimasu!